Your child’s first dental visit will start in the waiting room, which will hopefully be a fun and interactive place. A good pediatric dentist will have a welcoming, kid-friendly waiting room with plenty of toys and distractions for kids. This not only keeps them busy while you wait, it also provides a positive experience right from the start. While you’re waiting, you’ll likely have to fill out the usual health history forms and give insurance information. During the exam, you and the dentist will sit facing each other with your child on your lap, facing you. You’ll then lay your child back so their head is in the dentist’s lap. This will give the dentist a good view, while giving your child the comfort of mom being close by. With a small handheld mirror, the dentist will look in your child’s mouth and count the teeth out loud. The first visit especially should be brief – you’re just trying to get your child comfortable with the idea of someone poking around in their mouth! However, sometimes cleanings and/or fluoride are required, depending on your child’s cavity risk. 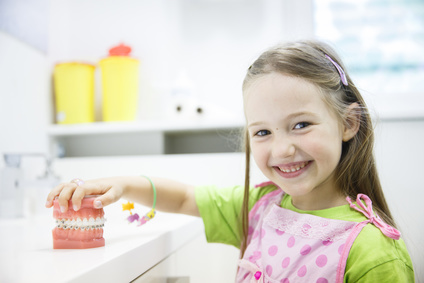 As you’re leaving your child’s first visit, you should know how their teeth are doing, what you should expect in the future, and your responsibilities for their good dental hygiene. You should also know when to follow up with their next appointment. Your child’s first visit can be a little intimidating – will they clamp their mouth shut? Will they bite? Will they cry? They may do all three of these and more, but your pediatric dentist should be ready for it. Thankfully, if you start young, this brief visit will be a great start to your child’s lifelong dental hygiene.